My exhibition ‘Festival in a Box: Archives’ is on display from 21 September to 30 November at the Leeds College of Art. 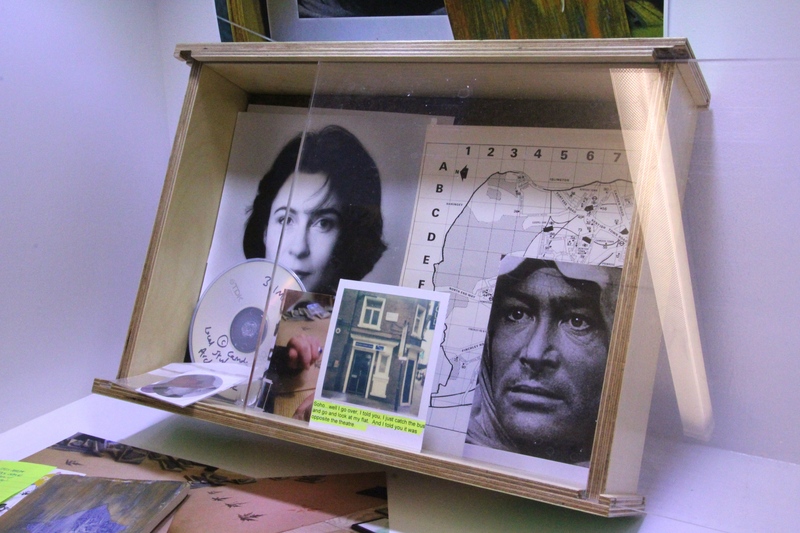 The exhibition draws together selected texts, objects and artefacts from from the archives assembled during the AHRC-funded research project ‘Bloomsbury Festival in a Box: engaging socially isolated people with dementia’. Also on display are series of original photographs inspired by the contents of the archives. Between August 2013 and June 2014 the AHRC-funded research project ‘Bloomsbury Festival in a Box: engaging socially isolated people with dementia’. took a mobile version of a community arts festival into the homes six of people living with dementia. A collaboration between the School of Advanced Study, the Bloomsbury Festival, Age UK Camden and University College London, the project explored the value of using the arts to engage people with dementia. In the process, it built up seven interlocking ‘memory archives’ of stories, objects and original artworks. ‘Curator’s Choice is a new series of sample displays with work selected by the Curatorial and Exhibitions Manger. Dispersed around our Blenheim Walk campus, this surprising trail of cabinets of curiosity highlight a selection of innovative research-practice, often work-in-progress, from a range of internal and external colleagues.